Fifty-six years after the signing of the Élysée Treaty, Merkel and Macron unite to empower Germany in an independent European empire. On January 22, German Chancellor Angela Merkel and French President Emmanuel Macron will sign a new treaty of friendship. The so-called Aachen Treaty will complement the 1963 Élysée Treaty. The original treaty laid the foundation for German-French reconciliation, 18 years after the Second World War. There are, however, a few differences between the Élysée Treaty and the Aachen Treaty. Most important to note is the location where the treaty will be signed, how it empowers Germany, and one important omission. 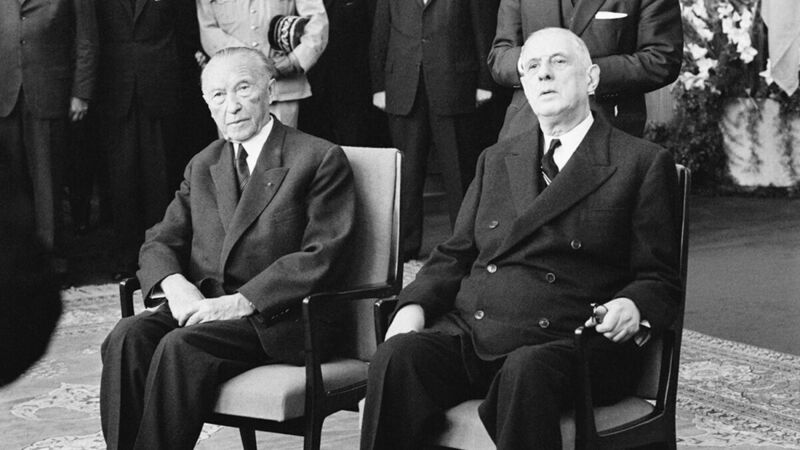 The original Élysée Treaty was signed by French President Charles de Gaulle and West German Chancellor Konrad Adenauer at the Élysée Palace in Paris. The treaty’s goal was to reconcile the two war rivals and to help them begin cooperating closely with one another. German Chancellor Konrad Adenauer and French President Charles De Gaulle listen to the welcoming address by Lord Mayor Burauen in Cologne’s town hall. Notable about the Élysée Treaty was de Gaulle’s desire to strengthen the European partnership, making it independent from the United States and Great Britain. Postwar Germany, however, was still recovering from its defeat in World War ii and heavily dependent on the support of the Western powers. On the counsel of U.S. President John F. Kennedy, Germany included a preamble to the Élysée Treaty that committed the country to the U.S. and its institutions. De Gaulle believed this to be a betrayal of the German-French partnership. He, at the time, wanted to tie Germany closely to the French-German tandem, with France in the leading role. The setting for Élysée Treaty 2.0 is quite different. The U.S. and Britain are withdrawing from the Continent and its institutions. France and Germany are both openly hostile toward the U.S. The leading role in the French-German tandem is now indisputably held by Germany. Furthermore, France, under Macron, has totally committed itself to empower Germany to strengthen Europe’s independence. The Aachen Treaty, which will be signed on January 22 and approved by both nations’ parliaments on the same day, lists more than 60 projects for strengthening Franco-German cooperation, including “a cross-border employment agency, an investment program for the border regions, joint research programs, and a common investment fund for start-ups,” Germany’s n-tv.de reported (Trumpet translation throughout). The treaty calls on the regions around the Franco-German border to form “euro districts.” Some critics have claimed that the merging of public transport networks and utilities in French and German towns are a loss of national sovereignty. From the German-French perspective, however, it is a gain of European sovereignty. The Élysée Treaty of 1963 is, to this day, seen as a milestone in Europe’s history. But the Aachen Treaty of 2019 signals a much closer cooperation and is destined to be even more momentous. At the forefront of the treaty is the Franco-German united diplomatic alliance in European matters. In other words, France and Germany want to get things done and avoid long, drawn-out discussions in European Union bureaucracy in Brussels. In order to accomplish this goal, the two countries have a simple plan. In the future, Germany and France “intend to speak with one voice in Brussels, drawing up common positions before pivotal European Union summits in an effort to make the bloc a more decisive power on the world stage,” the Times reported. What this means is that the time for negotiations are over! Germany and France will now dictate Europe’s course. This will come at the expense of smaller European nations, as Trumpet executive editor Stephen Flurry explained on his radio show. With Britain leaving the EU, Germany and France are by far the strongest economies in the bloc. If the two agree on an issue, no one will be able to stop them. The Aachen Treaty is a milestone in European policymaking at a time when the restraining forces of Britain and the United States have been removed. But the treaty will not only drive Europe ahead, it will also drive Europe closer together. It will replace the currently divided union and create a more united, stronger empire. President Macron’s office stated that the increased cooperation favors the “security and prosperity of our peoples in the framework of a more sovereign, united and democratic Europe.” The treaty sets the course for Europe to draw closer together on the military, cultural, social and political level. Countries who don’t like this will soon no longer have a say. They will either have to conform, leave or be kicked out. Marine le Pen, a far-right French politician, called the Aachen Treaty an “unbalanced” diktat from Germany. In a way, she is right. The treaty greatly favors Germany, but ironically it is French President Macron who wants to empower Germany. The treaty states that a priority of the German-French diplomacy will be to seek a permanent seat for Germany in the United Nations Security Council. The permanent members of the unsc are the victorious allied nations of World War ii: the United States, Britain, Russia, France and China. In 2019, Germany holds one of the council’s rotating seats, and it has promised to use that power to oppose the United States and President Donald Trump. France strongly endorses Germany’s anti-U.S. stance. Prior to the Aachen Treaty, Germany called on France to sacrifice its permanent seat on the unsc for a seat on the EU. France rejected the suggestion, but has now decided to push for Germany to receive its own permanent seat. Germany was denied such power after it caused the death of 60 million people in World War II. But France is now ready to empower Germany. Even more alarming are Macron’s promises for a stronger military union. Under his leadership, France is no longer holding anything back to join its defense establishment with Germany’s. 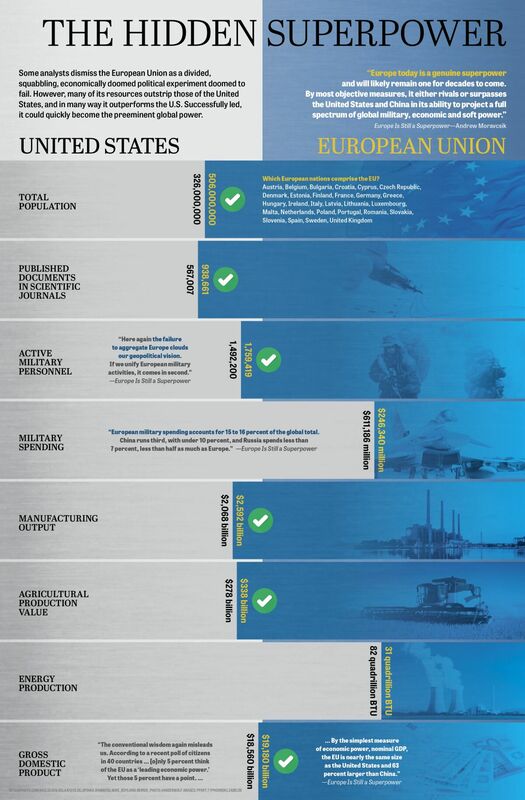 One of the goals of the treaty is to enable Europe to act “independently” in foreign and defense policies. Plans include joint training of soldiers, joint armaments projects and joint units deployed for stabilization missions. In other words, the treaty calls for a completely merged military of both nations, independent of the U.S. France no longer fears that Germany, due to its far greater leadership and industrial capacity, might control this army. Such details no longer matter to France, as long as Europe becomes an empire more powerful than the U.S.
Germany, of course, was denied a military after World War ii. But to create a more powerful European empire, nuclear-armed France has not only pushed for Germany to rearm, but also is now handing over its troops and armaments industries to Germany. France today may hope to create an empire that surpasses the strength of the United States and Great Britain. President Macron might even think that he could be the leader of this coming empire. But he knows full well that for this to happen, France needs to empower Germany—the real driving force of Europe. The Aachen Treaty does just that: It empowers Germany. While this may be just what France is hoping for, it will soon find itself subordinate to the power it just strengthened. It’s interesting to note that Germany and France also seek to further strengthen mutual language programs. Isn’t it ironic that France is now signing deals with Germany, allowing things that Germany had tried to force on France? Wouldn’t you think France would rather sign treaties with Britain or the United States, who helped it in both world wars? If you see these events in light of Bible prophecy, you can clearly understand what is happening: France is betraying the U.S. and Britain. The biblical identities of France, Germany, the U.S. and Britain are explained in The United States and Britain in Prophecy, by the late theologian Herbert W. Armstrong. In his book, Mr. Armstrong explained this prophesied betrayal. France, Britain and the U.S. are all descendants of Jacob’s sons. France is descended from Jacob’s eldest son, Reuben. But due to Reuben’s misconduct and betrayal of his younger brother Joseph, he lost his birthright. His birthright blessings were transferred to Joseph’s sons: Ephraim and Manasseh. These two sons grew into tribes, which grew into nations, and which became Britain and the United States, respectively. Mr. Flurry’s article, written prior to the revealing of the Aachen Treaty, correctly predicted the intent and purpose of the treaty. The content of the Aachen Treaty should give its readers goosebumps. But the location where the treaty is to be signed is far more alarming. Not only does the location of the signing reveal France’s submission to Germany, it also prompts flashbacks to history’s darkest time. While the treaty has been planned for months, its location was a mystery. “There is a lot of space and many places between the tip of Brittany [France] and the eastern tip of Germany,” French President of the National Assembly Richard Ferrand said in November. This month, the chosen city was announced: Aachen. Why was Aachen chosen for this historic occasion? Aachen holds enormous historic significance for Europe. The historic importance of this city traces back to the early ninth century, when Europe was first united through the efforts of Holy Roman Emperor Charlemagne, who ruled from Aachen. It was just eight months ago that Macron and Merkel met in Aachen to celebrate another historic occasion. In May 2018, Macron was awarded Europe’s annual Charlemagne Prize for his efforts to unite Europe. It was from Aachen that Charlemagne built his empire and united Europe. It is again from Aachen where France and Germany want to resurrect this empire and unite Europe once more. Today, the city of Aachen is seen as a symbol of European unity, but few ask how that unity came about. From Aachen, Charlemagne orchestrated the subjection of Europe’s pagan tribes and their conversion to his version of Christianity. For his efforts, he was crowned emperor of the Holy Roman Empire on Dec. 25, a.d. 800, by Pope Leo iii. Charlemagne was of Germanic and French descent. He established the empire’s headquarters in Germany, setting up Germany to rule the Holy Roman Empire over the next few centuries. Throughout these centuries, the empire’s emperors were crowned in Aachen, worshiping Charlemagne’s legacy. It was in Aachen that Charlemagne set the example of European cultural religious unity. 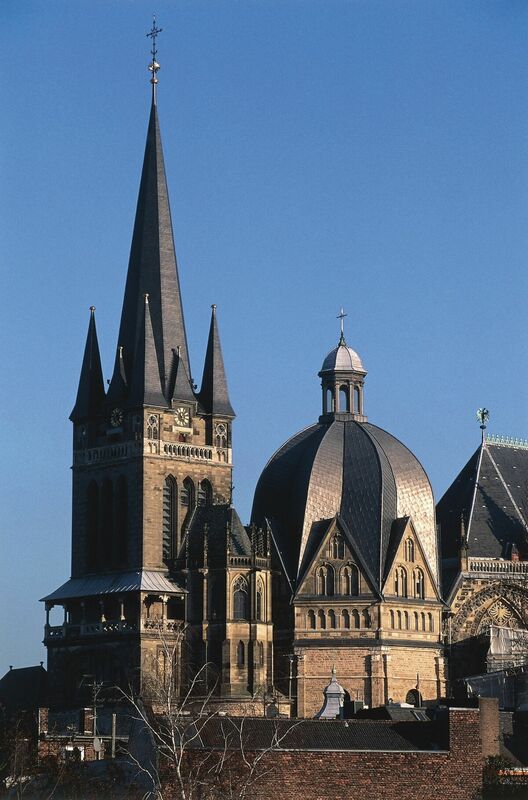 He chose Aachen to be Germany’s political and religious capital, and where he built the famous Aachen Cathedral. From Aachen, Charlemagne ruled an empire that was united through bloodshed. Blood spilled to build the empire. Blood spilled to fight off invaders. Blood spilled to convert Europe to Christianity. Aachen is where church and state united into the most gruesome murderous institution in mankind’s history. Charlemagne was relentless in expanding his power and religion. He fought for 30 years to subject the German state of Saxony to his crown and Catholicism. And he used the most brutal methods of warfare the world had seen up to that point in history. “[T]he violent methods by which this missionary task was carried out had been unknown to the earlier Middle Ages, and the sanguinary [bloody] punishment meted out to those who broke canon law or continued to engage in pagan practices [as he called them] called forth criticism in Charles’s own circle,” Encyclopedia Britannica states. In a.d. 800, Charlemagne started the First Reich, which lasted until 1806. Today, it is known as the Holy Roman Empire, which was responsible for the death of 40 million people in the Middle Ages. The world could have known what was about to unfold by knowing Charlemagne’s history and seeing Hitler’s military buildup. Today, France and Germany are pushing for a stronger, more independent military, while at the same time praising Charlemagne. History sounds a strong warning, but the Bible’s warning is even stronger. The first of these prophesied kings was Justinian. The second was Charlemagne. Number five was Napoleon, and number six was Hitler. As Hitler was on the scene, God revealed this prophecy to Mr. Armstrong. That is why it reads “one is, and the other is not yet come.” We are now seeing the rise of “the other is not yet come.” He will be the prophesied strongman of Europe who “will command the army Macron is helping to build right now!” as Mr. Flurry noted. The prophecy in verse 10 states that this strongman “must continue a short space.” Why just a short space? Because world conditions will get so bad that Jesus Christ will have to personally intervene to save mankind from self-annihilation! “And except those days should be shortened, there should no flesh be saved: but for the elect’s sake those days shall be shortened” (Matthew 24:22). But you don’t have to experience these things. You can escape the coming suffering! Request your free copy of He Was Right to learn how God’s Bible-inspired prophecies, as revealed to Mr. Armstrong, have come true. Also read Mr. Flurry’s article “France Rejects America—and Empowers Germany!” to learn more about France’s prophesied betrayal of America and where it is leading.